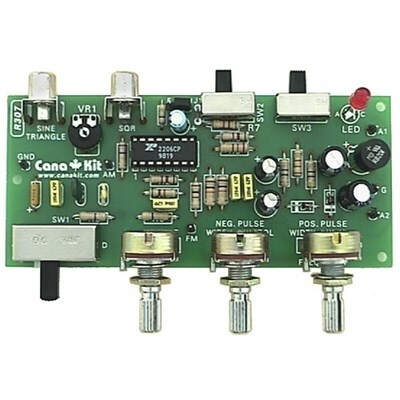 PC board dimensions: 4.70" x 2.08"
This function generator is an indispensable piece of test equipment for any electronic technician or hobbyist. Its design is based on the popular XR2206 monolithic function generator Integrated Circuit capable of producing high quality sine, square (or pulse), and triangle waveforms. The function generator operates over four overlapping frequency ranges: 10Hz to 200Hz, 100Hz to 2KHz, 1KHz to 20KHz, and 10KHz to 200KHz. In each range setting, you can adjust the desired frequency and amplitude.